"I am very pleased with the designer session that included complete makeup that “looked” like me. I also felt comfortable through the session, laughing and being able to relax while being photographed. The photographs say a lot about who I am and would recommend Vakker Portraits as a wonderful experience." “The sessions we had for Garrett were a lot of fun for Garrett. The attention to detail and creativity that the photographer gave to Garrett’s photos produced excellent pictures in each one of his looks to capture his personality and unique characteristics, formal to casual, with his favorite things like his car and his competitive sport of Olympic Fencing. The photos were so great and so expressively Garrett, we could hardly choose what we liked the best. With great care the pro at Vakker helped us make our selections and now we have the most gorgeous photos of our son that represent his 18 years of growing into the young man who is graduating as a Senior in high school and going off to college in the fall. These photos touch my heart, bring happy tears to my eyes as I look at them, and remind me of all the fun we had raising Garrett, and the pride we have in him and his future. Thank you Vakker!” Cheryl (the mom). “I would say that the whole experience from setting up the appointment through selecting the final photos was wonderful. Everyone made me feel comfortable and the pictures are amazing. I was glad there were photos taken outside and in his Mariners jersey because that captured his love of sports and the outdoors very well. "When taking pictures with Vakker you get a sense of professionalism, comfortability, and satisfaction. They make the senior picture process a breeze! Their photographers are friendly and personable and do a great job of helping bring out your true personality. In addition, their facility has an endless supply of scenery combinations (both indoor and outdoor) and the photographers know just how to set up the perfect combo to suit you and your outfit. I am completely content with how my photos turned out. Vakker has exceeded my expectations!" Jared E.
"At first I was nervous to be a senior rep because I wasn't sure how the photos would turn out. But once we started the shoot I felt so comfortable and the photos turned out great! Thank you Vakker Portraits!" -Tali I. "My family and I chose Vakker Portraits for my senior pictures because they sent us a flyer in the mail near the end of my junior year. We had been thinking about having my pictures taken over the summer, but we hadn't looked at any places to get them done when the flyer came. Another reason we chose Vakker was the Designer Session they offered, part of the designer session included having my make up professionally done which was perfect for me because I don't usually wear any make up and am not good at applying it. My experience at Vakker was amazing! I had never been professionally photographed before and was terribly nervous, but everyone that I met there was extraordinarily kind. Jesse, who did my make up, talked me through what he was doing and he listened my opinions and requests about how I wanted to look. Danielle, who was my photographer, sat down with my family and I prior to photographing me and went over all kinds of poses that I was comfortable with and ones that I just didn't want to do. She also was a HUGE help in deciding what outfits I wore. Because I was so nervous, I overcompensated and brought like nine outfits when you are only photographed in four but Danielle was awesome in narrowing down what would look best and capture who I am. Our second visit, when we went to pick up the proofs, went really well also. Kara, who showed us all my pictures, walked us through all the different kinds of things we can buy like packages, collages and grad party invites in great and clear detail which was amazing because I am the first senior in my house and we were really in the dark. I have actually already spoken to two of my friends about Vakker. I think that it is an awesome place to get your senior pictures done, the environment is very friendly and I remember laughing a lot while getting my pictures done. I tell them about my experience at Vakker and they seem to be interested in having their pictures taken at Vakker too! For someone like me, who is usually very shy and reserved around people I don't know well, I was exceedingly nervous about having my picture taken. However, once I got to Vakker and talked with Jesse and Danielle (and later with Kara) my nervousness went away and I had a genuinely amazing experience because of the friendly people and the comfortable environment. I was able to let go and relax, and it shows in my pictures, which turned out so well that my family and I can't decide which one to use! " 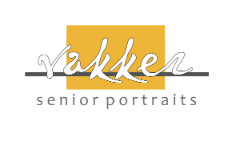 Kate M.
“Everyone at Vakker is very personable and cared about how my senior photos turned out. The people at Vakker are very flexible and easy to work with. The makeup artist was able to take what I said and give me the perfect look. During my photo session my photographer made me feel relaxed, comfortable, and I had fun. At the Vakker studio there were so many photo backgrounds to pick from, so I was able to get my athletic shots along with my other graduation pictures done all in one session!” Skylar H.
I have seen a lot of my friends at Bellevue High take their senior pictures here at Vakker Portraits and when I received their July promotion, I immediately knew I had to take my mine here. My friends' pictures turned out amazing, and I received nothing less. It was absolutely amazing! I have never taken pictures professionally, or rather at all, so I was kind of scared going into my session, but Danielle made me feel really comfortable and led me in all the right directions. She kept me talking and smiling which made my pictures that much greater. Go here! You can't beat the service and the kind nature this place brings. It's a great and fun experience AND you get amazing senior pictures out of it. "The staff at Vakker is very friendly, caring, and professional. They really wanted to make sure we got the end results that we wanted and did not push us to make a sale. As a parent, I take a lot of photos myself (as do many of us nowadays) so I wanted my son’s senior portraits to stand out from the typical photos of him. The photographers at Vakker were able to capture the style and personality of my son through their recommendations on wardrobe and their studio backgrounds and lighting. I am extremely pleased with the results. We had such a good experience we are thinking about a family portrait session before my son goes off to college!" "Our experience was terrific! In fact, we had our older daughter come to Vakker's for her senior portraits and liked it so much that we came back with Veronica! The entire team really takes the time to get to know your child's personality and preferences. They're accommodating and go the extra mile to ensure a positive experience. The quality of the portraits are very good." "We chose Vakker Portraits because we liked many of the portraits featured in the gallery and knew of several other students who had their portraits taken by Vakker. We enjoyed working with Vakker very much. Scheduling the sitting, preview and ordering appointments was easy and convenient and our son had a pleasant and comfortable experience with the photographer. If you're choosing - look for a studio/photographer that takes great portraits and is pleasant and convenient to work with in all three stages - as we did!" "Vakker Portraits brought out the best in Kate. Their photographers have a keen ability to capture the spirit of the individual and their wide offering of backgrounds is amazing." "We have used Vakker Portraits for family portraits, holiday greeting cards and children’s photos since our children were babies. Vakker Portraits is awesome! We love all of the photographers and staff, and the quality of the photos and the variety of backgrounds is always top notch. I love the variety of the products available – color, sepia, black and white, and besides the typical framed portraits, there is canvas, metal and numerous styles that can be ordered. I’ve also been able to go back to order additional prints and canvases of family portraits from previous sittings done years ago. Vakker Portraits is the best place to go for senior pictures. They take the time to use many different backgrounds and align the theme of the photo shoot with the interests and attire of the individual. We love Vakkers!" "We were referred to you for our first son's senior pictures... And we had an amazing experience. You captured the personality of each of the boys and at the same time gave us the most amazing pictures that we will cherish for ever. They truly were like a piece of art! We couldn't have been any happier. I will tell everyone to use you. You take some of the stress out of a emotional time. And on top of it your customer service was great! You worked hard to make our package work for us! Thank you so much!" "We chose Vakker because we were so happy with our oldest son's senior portrait session and photographs with Vakker. Both boys were not at all interested in getting portraits done. But both ended up having a great time at the session, which made our photos turn out fantastic! We will be doing our last senior portrait session this summer, as our daughter is in the graduating class of 2017!" "I was doing a bunch of research and looking through all the different companies photos and Vakker was my favorite. Vakker's photos were the least touched up and the most natural. I absolutely loved my session. The lady taking my photos was super sweet and knew exactly what angles I looked good in. And the photos turned out amazing! I've never had a photo shoot done and that was the best first experience. If you want to look natural and have your photos turn out amazing? Vakker is the way to go. Turning seniors into models!" "We chose Vakker for the high quality & reasonable pricing. Working with them was a great experience. They were flexible with our schedule, getting our son in at a convenient time. The photographer was very professional & made my son feel at ease during the shoot. He actually had a good time and it shows in his pictures! Another thing I appreciated with Vakker is they offer a lot of different options for ordering pictures. You can order as much or as little as you like. I would tell anyone looking to have senior portraits done, Vakker is the place to go!" "Our experience at Vakker was awesome! We were a little nervous with how the process worked but became very comfortable the minute we walked in. We loved it! Kat said she didn’t feel awkward posing and felt very comfortable with the photographer. Picking out the pictures was easy and we didn’t feel pressure to purchase every pose. Before choosing a photographer, we asked several friends about their senior photo experience. Vakker received several compliments on service as well as the final product. We are so happy we came here." "Thank you for making this such an easy experience! I was actually dreading the whole process, but it could not have gone smoother, and we are so happy with the pictures." " I liked how I was encouraged to let my individual personality come through in the photos, not just the usual poses that everyone else may have." "I really appreciate the indoor and natural outdoor settings used for the photos as well as the variety of moods you were able to capture. It really showed the many sides of our son. And I loved that there were so many proofs to choose from, hard as that was!" "Thank you for spending the time with us in the session and after when we were making the selections! So many great shots! It was so hard to choose! We will be back for our family portrait." "When it came to deciding on who to use for Jenna’s senior pictures, I always like to get a quality referral. My sister used Vakker Portraits for all of her three son’s senior pictures (her first son graduated 14 years ago) so I gave them a call! My situation was unique because I needed to get year book pictures in, but also wanted to take photos once my daughter had her braces off. They worked with everyone one of my needs and because I was coming from out of town adjusted schedules to make it easier for me. I loved my experience with Vakker. The makeup artist was so friendly and let me control the amount of make up so I felt comfortable. Then during my session the photographer was so great! In most of my photos shot with other companies I have this fake smile that my family hates but with Vakker that didn't happen! With the hip music in the background and the photographer getting to know me and my personality I was able to shine. Plus my photos were perfect! Not over edited but I looked amazing!